It's a bit belated, I know! I am just settling back in from my latest trip to Ireland where I took the photos below...more to come! I'm joining the party at Mary's Little Red House for Mosaic Monday...can't wait to see all the other mosaics! Lovely mosaic, great shot of the frost on the ivy. It looks very cold there. These are just beautiful! Where in Ireland did you travel? I went in 1998 and just loved the western part. Look forward to seeing more. So beautiful!!! I love the photo of the fenceline!!! Very pretty. Ireland's been hit rather hard by the snow and ice, but how lovely it all is. How beautiful! Can't wait to see more of your trip. Brrrrrrrr! 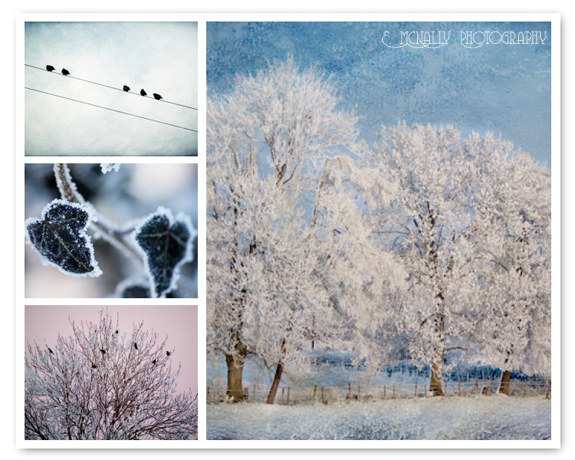 Beautiful shots of the frost. Lovely mosaic....definately want to see more! Way to go, sis - these are incredible - as usual.